Instead of smoothie Monday, I am making it smoothie Tuesday, after all, any day can be a yummy smoothie day! I have been on such a smoothie kick it lately, it isn’t funny! I love having it for breakfast everyday; they fill me up until my 10am Starbucks run! 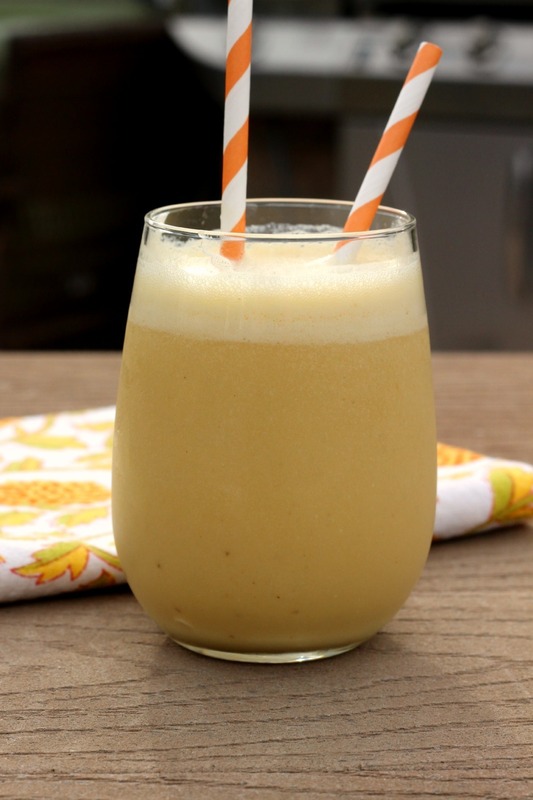 So today I have for you The B-O-B Smoothie. Your probably thinking, what a weird name for a smoothie. Can you guess what B-O-B stands for? It’s Blood Orange and Banana. I thought I would have a little fun with my smoothie name today. This smoothie tastes amazing! It’s so refreshing and perfect for a morning wake up. 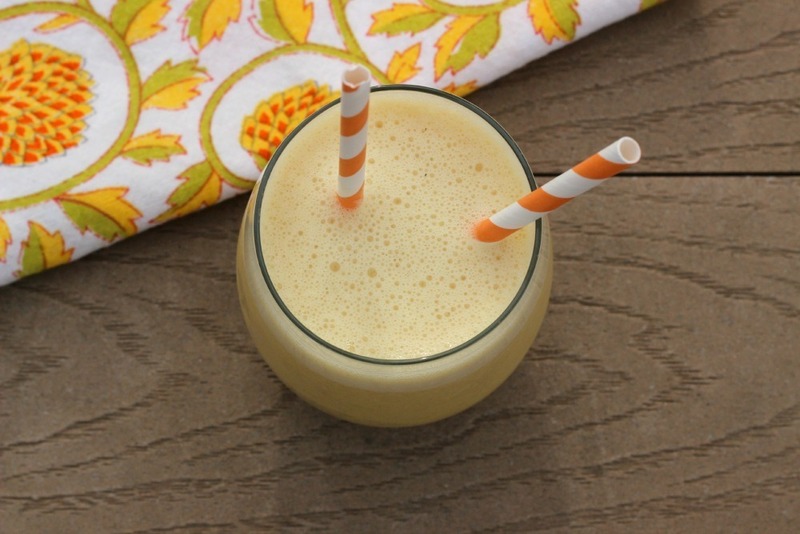 It has the most wonderful orange flavor with a blast of banana flavor. To keep it vegan, I used unsweetened, vanilla almond milk. Dam that stuff is good in a smoothie. I used to not like almond milk, but I fell in love the vanilla flavored one. I am so glad and you can’t beat 30 calories for a cup! I made this smoothie on Sunday morning and I shared it with my Husband and he said he loved it. It is really the perfect wake me up smoothie, plus it makes you smile. I love food that makes me happy, especially healthy food! 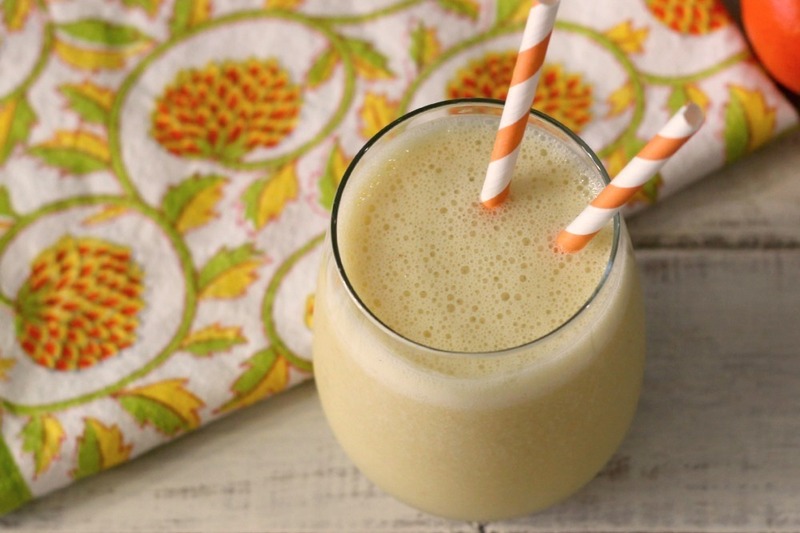 This smoothie gives you a nice nutritional boost too! It’s has 77% vitamin C and has 542 grams of potassium, which is great for your muscles. My Husband always complains if his legs hurts, so I try to help wherever I can and he kind of has a thing for banana’s. Well I think he does? I but them every week and he eats them all. It’s hard for me to make smoothies with bananas because they disappear so fast. A creamy, refreshing, no-sugar added, vegan smoothie made with freshly squeezed blood oranges and a frozen banana. All all ingredients in a blender and process until smooth. 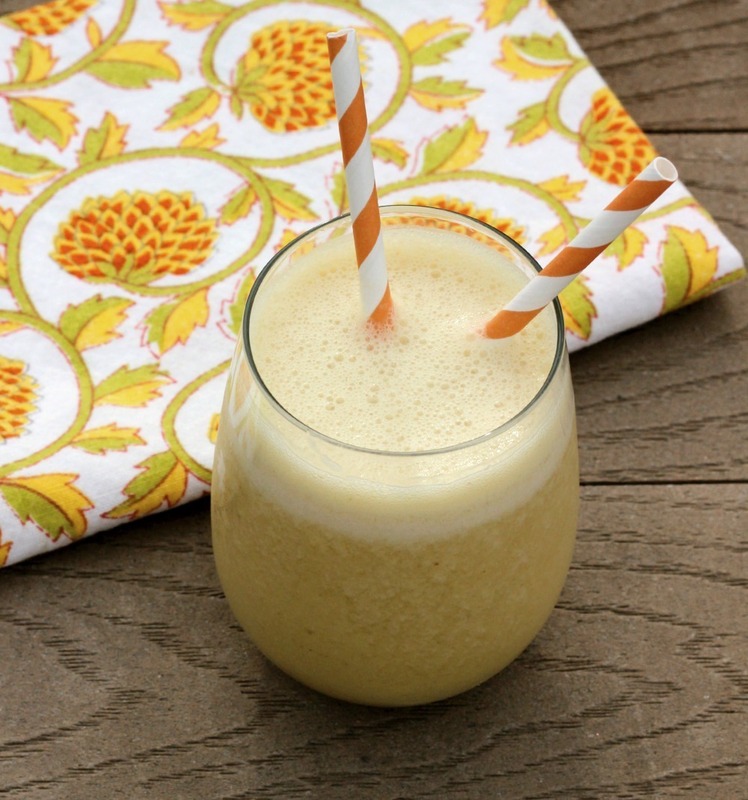 This smoothie would be great to make in a big batch and serve to your family for a brunch or Sunday morning. It’s light and not heavy, so it fills you, but not stuff you. I am just loving blood oranges right now and I am so glad I finally got some. I have kept my eye out for them in the stores this year and so far I haven’t seen them. I got these from my CSA box. I am hoping that I will get more this week. Crossing fingers!! Well my Friends, I am off to write another post. I try to do them in advance so I have time to make other yummy treats. I love the picture, the napkin is so bright and cheerful. I will be making this today! Thanks Janet! Let me know how it turns out for you! Blood oranges are so unique and delicious. Your bob smoothie is the perfect combo and you know how much I love bananas. lol, Yah I know you and your banana’s silly!! I did take picture with my last blood orange but it didn’t turn out. Stinkers! I need to start making smoothies during the right light! Just made this for my kiddos and they think it kind of tastes like bubble gum. Love It!!!! 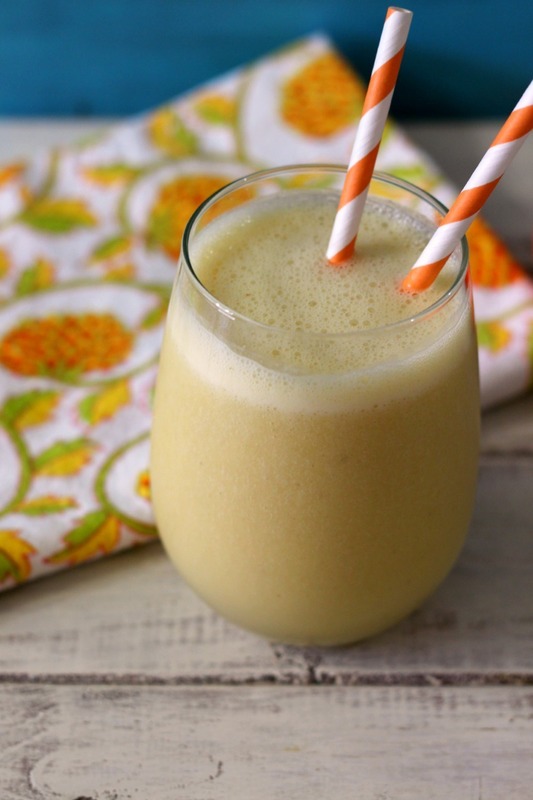 A yummy smoothie perfect for sipping while watching the Super Bowl!! Thanks for sharing this great recipe! Thank you Kara! This is a fun drink! I just love it! !